Access Control as a Service (ACaaS) - Disruptive? - Altec Systems Inc.
Access Control as a Service (ACaaS) – Disruptive? Posted on March 26, 2014 at 9:30 am. Access Control systems have been being deployed for many years. Traditionally, an end user would procure these systems via a medium to large capital expendure. Today, with technologies such as software as a service and mobile devices, is this business model being challenged by Access Control as a Service (ACaaS)? Access control manufacturers have been designing their systems with more and more intricate features. These features can include integration to closed circuit television, building HVAC systems, and visitor management. These manufacturers spend countless resources upgrading their software to add these new features and accommodate existing and new integrations. Costs are typically passed on to the end user in the form of software support agreements and other support costs. Today’s access control manufacturers typically write their software to communicate with the access control equipment only, increasing costs even further. 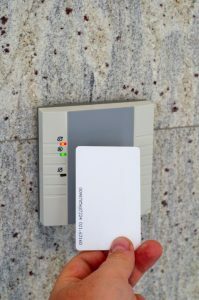 It is not uncommon for today’s access control systems to be in the $3,000 per reader price range. The number of readers in the average system installed today is typically less than eight. Many of these end users are single locations that are controlling only a few doors. Their requirements include locking doors, either 24/7 or on a schedule, and allowing only authorized card holders access to these doors. Very rarely is integration to other systems required. The system provides them a basic level of security with the ability to audit the activity on the system. What is Access Control as a Service (ACaaS)? The access control software is typically delivered via a multi-tenant application that resides on a server either in a data center or central station. The customer accesses the application via a web browser. The cost of the software is included in the monthly subscription fee. The application is shared over many customers, so the support costs are lower than an on premise system. Since the software is hosted outside the customer’s firewall, the security provider can easily provide remote support and assistance. Additionally, since most customers only require basic access control, lower cost control panels may be used, helping to lower the initial investment by the customer. A typical ACaaS customer will average 2-4 readers. They do not require a lot of the bells and whistles that manufacturers typically incorporate into their systems. The basic functions of the system are a “good enough” solution. Many of these customers are looking for a simple system to provide an audit trail and replace their traditional door keys. As web applications become more robust and the cost of providing the service decreases, ACaaS could gain significant traction being deployed in larger access control systems, thereby disrupting the traditional access control market.